The partial opening of the Henley Street Bridge last week was a welcomed event for South Knoxville businesses and residents, and the plans the city is making for the former Baptist Hospital might bring even further progress. The Knoxville City Council’s decision to approve a $22 million Tax Increment Financing (TIF) over 30 years kick starts the demolition and development of the old hospital site. Described as an “eye sore” the abandoned hospital and surrounding medical and office buildings could eventually become a site of a hotel, student housing, apartments, retail stores, and a river walk that links the site to the City View Apartments just down river. The Developer, Blanchard & Calhoun, asked the city successfully to pledge the funds that would go to improve and add roads, extend the Riverwalk, and build a public pavilion. Rhodes Seegar of Blanchard & Calhoun told the council that plans include demolition of part of the hospital from January until September of next year. The exterior of the Baptist Professional Building and the Eye Institute exteriors will be done, working around current tenants there. The Baptist Tower will be renovated starting in March and 250 student houses will be built in the current parking lot. The $160 million dollar project also calls for 18,000 square feet for retail businesses, plus a motel, apartments, restaurant and fitness center. When completed, the project is expected to provide 1,500 to 2,000 new jobs. In a related vote the city council, on First Reading, voted to add additional funding of $2.5 million to the River Edge Apartments, a $15 million development, to widen roads and extend the Riverwalk and add a dock. 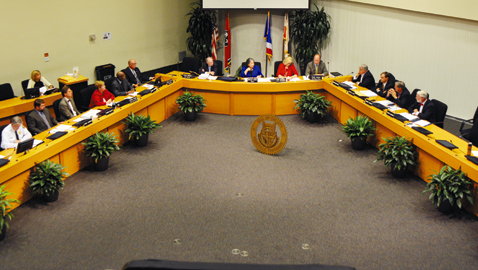 The council also voted, on the first reading, to issue $32 million in bonds, bringing the city debt to just over $200 million dollars.